Your pick-up truck. You’ve been through a lot together. Camping trips, motocross bike treks, football tailgates…and maybe even hauling your snowboard up to “shred the gnar” on your favorite mountain. But for the millions of Americans that have more than just a recreational relationship with their “buddy on wheels,” pick-up trucks provide an invaluable, and also highly flexible, source of ongoing or ancillary livelihood. If you’re already in this camp—and think of your truck as a trusted work-utility vehicle—then you’re no stranger to its role in helping you work your daily gig. And for those owners who haven’t yet considered their rig as anything more than an enthusiast pastime and excellent way to cruise around, it’s worth taking a new look at how your Ford, Ram, Chevy or Toyota investment might actually earn you some extra bucks for a rainy day. The average pick-up truck can haul approximately 12,000 lbs. While this figure is dependent on the type of truck and exact size of the bed, it shows, in general, that even the typical pick-up can accommodate a serious amount of gear. If you’re already in the business, you know that the sky’s nearly the limit for what you can fit in that vast cavern behind your cab if you really try…and newbie work-truck operators would be surprised to discover the many “haul for hire” opportunities they just might be missing. There is good upside to using your pick-up as an economic tool. Using your pick-up for work purposes provides the flexibility to gain employment and attract full or part-time jobs in multiple fields, across multiple industries. Whether using your pick-up is part of a 9 to 5 gig or whether you’re a side job kind of guy or gal, owning a work-utility pick-up offers an “economy resilient” form of work that can help weather the highs and lows of the mass market and traditional lines of employment. Using your pick-up for work is the ultimate blend of work and play. And why only work when you can have fun at the same time? According to the online hub Car Throttle: “…the pickup truck is a symbol for the American Dream…The American dream is (about) merging work and play into one task. When your work is also your play, you are living the American Dream.” And when that dream involves riding gloriously on four wheels with V-8 power, now really we’re talking. For any pick-up truck lover, the option of making money while simultaneously getting behind the dashboard of a vehicle you have heart and passion for, is what those of us at Bullet Liner would call our kind of job. You can’t build an organization to become the leading spray on bed liner company in the U.S. without having a few pick-up trucks to help get the job done. A work truck is one of the most valuable pieces of inventory any small business operator can own. Just ask anyone that relies on their truck for work-utility purposes and they’ll tell you that it’s a central element of their business operation and solvency. And they’ll likely also share the fact that owning and managing a small business that depends on the “fitness” of this all-American mechanical workhorse means it must be cared for day in and day out. That means regular tune-ups; tires and brakes that can handle the extra load and longer driving schedule; and solid components, premium oil, and a quality fuel grade selection. It’s important to give some extra TLC to your truck bed—after all, it’s doing a lion share of the work. Whether you use your pick-up to carry the tools of your chosen trade (gardening tools, construction equipment, feed and tackle, marine gear, motorcycles, and more) or use it as a part-time delivery vehicle to haul things for a project fee (junk, furniture, automotive parts, etc. ), you need to safeguard every element of your truck, including the bed. For one, you don’t want it to be severely scratched, dented and damaged (because that doesn’t look nice to potential customers and it can also lower your pick-up’s eventual resale), but it’s also a serious safety hazard. 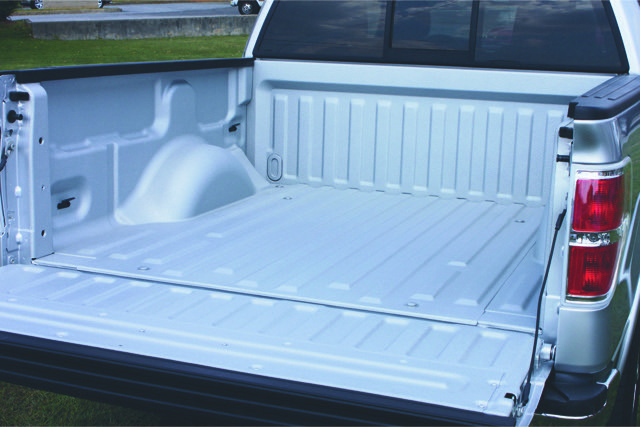 Providing your truck bed with a coat of Bullet Liner’s premium protective sealant and truck bedliner helps ensure that items won’t slip and slide in transit. Along with offering UV color protection (to ward off the extreme elements), Bullet Liner coating also offers the extra grip that helps keep you—and whatever you’re toting around—safely in one piece. You need to know the facts before operating your pick-up as part of a business. In case you’re new to a truck-facilitated line of work, there are certain regulations to be mindful of, and to proactively investigate. They often involve restrictions and guidelines for securing loads safely in your truck bed. Since regulations can differ greatly from state to state, and often require a special business license and non-standard insurance policies, consider consulting an informative resource such as the Federal Motor Carrier Safety Administration for additional details. Whatever line of work you choose to roll with, here’s to getting every ounce of mileage and enjoyment out of your pick-up…hands-down, the single most versatile vehicle on the road today.